John Marshall Maxey-1 was born in 1708 in Goochland County, Virginia. He died in 1779 in Buckingham, Virginia. Sarah Sampson daughter of Francis Sampson and Bridget Beaslet was born in 1712 in Goochland County, Virginia. She died in 1744 in Goochland County, Virginia. Edward Maxey was born in 1728 in Goochland County, Virginia. He died in 1816 in Buckingham, Virginia. Edward Maxey-2 (John Marshall-1) was born in 1728 in Goochland County, Virginia. He died in 1816 in Buckingham, Virginia. 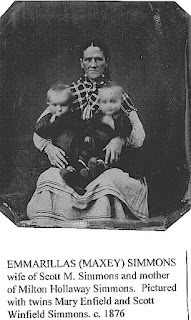 Judith Sarah Ford daughter of James Ford and Ann E. Bondurant was born on 06 Sep 1732 in Manakin Sabot, Virginia. She died in 1827 in Buckingham, Virginia. James Maxey was born in 1763 in Buckingham County, Virginia. He died in 1836 in Robertson, Virginia. James Maxey-3 (Edward-2, John Marshall-1) was born in 1763 in Buckingham County, Virginia. He died in 1836 in Robertson, Virginia. Phebe was born in 1752. She died in 1808. Holloway Maxey was born in 1806 in Buckingham, Virginia. He married Barbra Moake in 1831. He died in 1838 in Robertson County, Tennessee. Holloway Maxey-4 (James-3, Edward-2, John Marshall-1) was born in 1806 in Buckingham, Virginia. He died in 1838 in Robertson County, Tennessee. 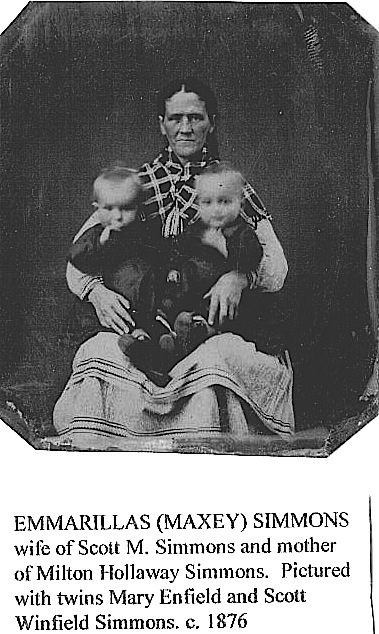 Barbra Moake was born on 28 Nov 1809. She died on 07 Sep 1887. Emmarillas Maxey was born on 08 Sep 1837 in Tennessee. She married Scott Mansfield Simmons on 29 Apr 1857 in Williamson , Illinois, USA. She died on 26 Dec 1901 in Williamson , Illinois. Emmarillas Maxey-5 (Holloway-4, James-3, Edward-2, John Marshall-1) was born on 08 Sep 1837 in Tennessee. She died on 26 Dec 1901 in Williamson , Illinois. Scott Mansfield Simmons son of James Simmons and Phoebe Grimes was born on 01 Dec 1837 in Williamson, Illinois. He died on 29 Jun 1916 in Marion, Williamson, Illinois. Melissa Jane Simmons was born on 26 Mar 1858. She died on 18 Sep 1865. Adel Simmons was born on 01 Dec 1860. She died on 09 May 1879. Margaret Rachel Simmons was born on 21 Dec 1862. She died on 03 Nov 1884. Milton Holloway Simmons[4, 5] was born on 14 Aug 1867 in Williamson, Illinois[4, 5]. He married Gurtrude Ann Chamness on 06 Dec 1904. He died on 05 Feb 1946 in Marion, Illinois. Winfield F. Simmons was born in 1874. He married Cornelia Chamness in 1900. Mary Enfield Simmons was born on 03 Aug 1875. She died on 05 Sep 1959. Marion W. Simmons was born in 1875. He died in 1969. Milton Holloway Simmons-6 (Emmarillas-5, Holloway-4, James-3, Edward-2, John Marshall-1)[4, 5] was born on 14 Aug 1867 in Williamson, Illinois[4, 5]. He died on 05 Feb 1946 in Marion, Illinois. Gurtrude Ann Chamness daughter of Johnathan Parish Chamness and Julia Ann Conley was born on 18 Oct 1877 in Spillertown, Illinois. She died on 05 Aug 1973 in Marion, Illinois. Samuel Simmons was born on 02 Sep 1902 in Williamson , Illinois, USA. He died in 1995 in Flint, Michigan. Theron Simmons Sr. was born on 31 Oct 1905 in Williamson, Illinois. He married Lela Goley on 28 Feb 1929 in Benton, Illinois. He died on 26 Dec 1997 in Herrin, Williamson, Illinois, USA. Ray Simmons was born on 15 Jan 1907 in Williamson , Illinois, USA. He died on 05 Sep 1996 in Williamson , Illinois, USA. Ruby Simmons was born on 23 May 1919 in Williamson, Illinois, USA. She died on 15 Aug 2002. Julia Simmons was born on 05 Aug 1911 in Williamson , Illinois, USA. She died on 17 Mar 1980 in Carbondale, Jackson, Illinois, USA. Mary Simmons was born on 17 Oct 1914 in Williamson , Illinois, USA. She died on 26 Nov 2001 in Michigan. Theron Simmons Sr.-7 (Milton Holloway-6, Emmarillas-5, Holloway-4, James-3, Edward-2, John Marshall-1) was born on 31 Oct 1905 in Williamson, Illinois. He died on 26 Dec 1997 in Herrin, Williamson, Illinois, USA. Lela Goley daughter of Levander A. Goley and Cora M. Dunn was born on 09 Jul 1906 in Williamson, Illinois. She died on 10 Jun 1996 in Marion, Illinois. Theron Simmons Jr. was born on 30 Oct 1931 in Ware, Massachusetts. He married Roberta June Hill on 28 Dec 1952 in Marion, Illinois. Eugene Lee Simmons was born on 06 May 1933.